Ever since i designed my first Stooge frameset i’ve been steadily working my way through various handlebars in an effort to find the perfect bar to compliment and make the most of the ride and geometry for the kind of riding i like to do. 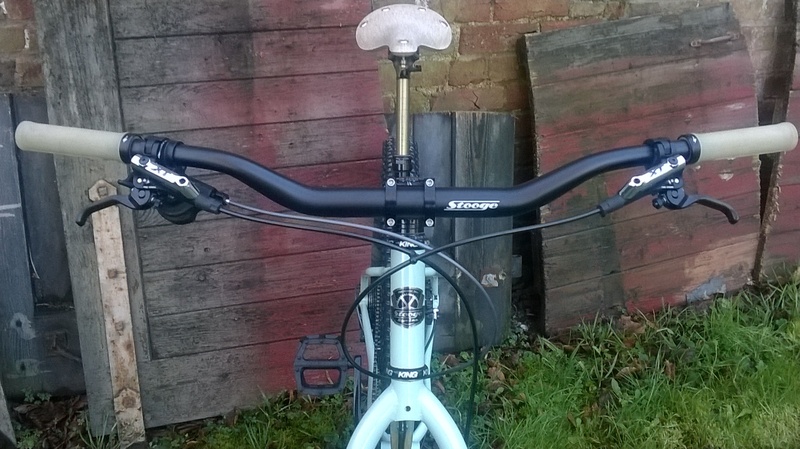 I started off with the Salsa bend Bar, which is great, especially for long days in the saddle, moved to the Jones bar which is supremely comfortable and already very popular with Stooge riders. The Nitto Bullmoose bar, Thomson Ti bar with 12 degrees of sweep have both come and gone, both great but both strangely lacking. And then about 9 months ago (depending on when you read this) i decided to put together a super-cheap playbike build, and in the spirit of Klunkerdom i picked up a set of 800mm wide motorcross bars and bolted them up with a BMX stem. At first they just felt crazy-wide but as the bike was singlespeed i soon realised they worked brilliantly for hauling up the 2 mile climb to the top of Candy Woods, and after a couple of blasts back down i was completely sold, they brought the bike to life in a way i’d not envisaged. I spent the next six months blasting around with them, and whenever i got back on my ‘proper’ bike with gears etc, it just felt plain wrong. The motorbike bars gave so much control and speed, not to mention comfort, that not even my ill-fated tree chopping experience at SSUK15 could dampen my enthusiasm. September last year i recieved an e-mail from Joe at Leeche International in Taiwan, just a friendly introduction where he told me he liked my bikes (thank you, Joe), this led to him coming to stay in Oswestry for a social after Eurobike, a night on the town and a day spent riding in the pouring rain. Leeche International were pretty much responsible for facilitating the whole fatbike thing for Quality Bike Products, so they know their stuff. When Joe said he’d like to work with me in the future it started a train of thought where the impossible slowly began to feel like a possibility. So i designed a handlebar with a massive nod to the original Klunker barz of old, but for modern bikes. And so the Stooge Moto bar was born. It’s quite unique in that it’s the only superwide bar with a decent degree of sweep, 17 degrees in this case, and it works a bloody treat. To say i love this bar is an understatement. They’re 800mm wide, made from 7075 alloy which is the strongest alloy for a bar of this width, and the sweep and feel is just perfect. The massively wide and oversized section at the stem serves a number of cool purposes, first it looks grrreat; second, you can fit a massive amount of lights and computers or whatever to it (computers! on a Stooge!) and third, if you keep it nice and clean it makes a really nice relaxed, long haul riding position. 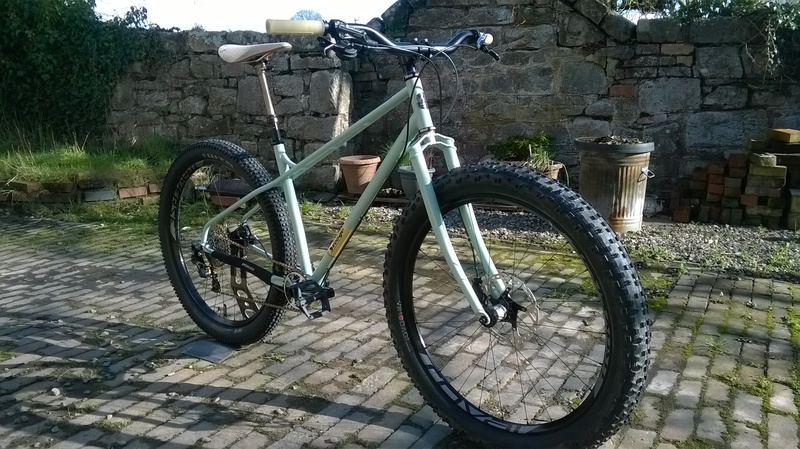 They obviously work brilliantly on a Stooge but will also be great on any rigid, singlespeedy, fatbike, ride it like you hate it thing. Hell, they’ll even add a touch of much needed Moto to all those non-moto suspension bikes out there. Once you’ve got used to the sweep there’s no going back. So here’s the numbers again. 800mm wide, 38mm rise, 17 degree sweep. Shootpeened black with a laser etched Stooge logo. All being well they should be landing in the next few weeks. Price is yet to be determined due to unknown influences such as exchange rates, shipping costs and the tax man, but they won’t be expensive or cheap. As soon as i have stock they’ll be up on the site to purchase.